Eaton understands that selecting the correct power management solution can be challenging, so we’ve made it simple by bundling the key elements into a single part number. 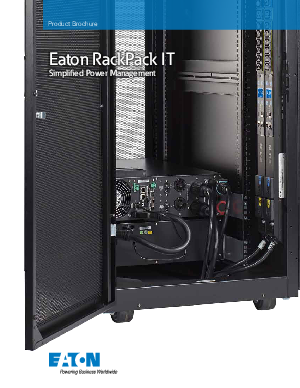 The RackPack IT comes pre-configured with a UPS, power distribution and management solutions, minimizing deployment time and maximizing protection. You’ll benefit from best-in-class power management whether your IT environment is large or small or if you manage equipment remotely or locally. You can even let Eaton do the heavy lifting with expert onsite assembly, installation and training to maximize your capabilities.